Monitoring basis trends at area elevators can provide valuable information, which may help you garner a higher grain price. Buyers and sellers of futures contracts determine the futures price for each commodity. Futures prices represent factors influencing global supply and demand for a commodity. Most of the time in Nebraska, basis values are negative. A negative basis can also be described as “under.” A positive basis, described as “over,” is also possible, indicating local demand is strong enough for the elevator to pay a premium over the futures price. It is incorrect to say that an "under" basis is weak while an "over" basis is strong. A weak or strong basis must be judged based on the average historical basis value. 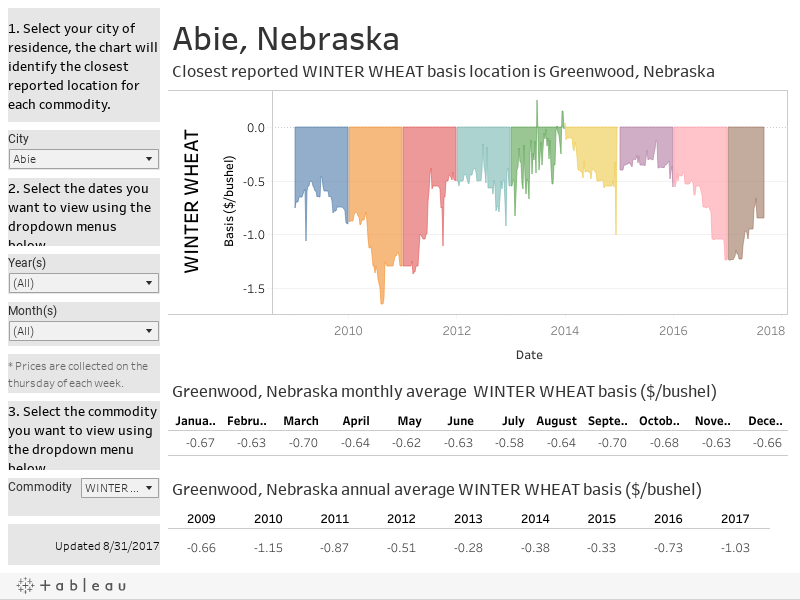 Tables and charts in the interactive visualization below were produced using price data for corn, soybean, and wheat reported by USDA’s Agricultural Marketing Service (USDA AMS) in the Cash Grain Bids sources for Nebraska (Omaha-Council Bluffs: WH_GR110, Nebraska Rural Elevators: WH_GR111, and Western Nebraska Elevators: TO_GR110). Prices are reported weekly using Thursday cash prices since 2009. (Not all locations are reported for all dates.) Locations listed have a population of 500 residents or more. Basis is calculated by subtracting the closing price for the nearby futures contract from the reported USDA AMS cash price. Daily basis values are illustrated (above) using a graph. The horizontal axis of this graph displays time in days. The vertical axis represents dollars per bushel. The tables below the graph show the annual and monthly average basis, based on the filters on the right side of the visual. It is recommended that producers maintain their own local historic basis data from area elevators to help understand and interpret current basis levels and trends. It likely will take some time to feel comfortable monitoring basis level and trends; however, your efforts will likely result in a stronger understanding of grain market fundamentals and higher cash price received.